Today, I found a 2 to 3 mm gap between two end joints on my maple hardwood floor which has been installed for 4 years, as shown in the picture. There was a tiny gap initially but don't know why it suddenly became so big? No water sprayed on the area. How can I get it fixed properly? How was it installed, floating, nailed, glued? There is no way you're going to get nailed boards to move, you will be relegated to color matching a good quality wood filler. Then go to the stain aisle and choose 5 or 6 stains that are lighter, but the same tone as your wood sample, get one that's close in color. When you get home, put several samples of Plastic Wood on a board and let it dry, then start testing your stain colors, mixing them together until you get a close match. Stains of the same brand and type can be mixed together to create your own custom color. how is the humidity in your house? Is there any chance this is the last piece in a row ? Maybe that one did not get nailed by mistake? If you want you could try removing the baseboard and using a laminate floor "kicker" or small bar to try and close up the space. Yes, Shannon. This is the last piece to the baseboard. I will open the baseboard and see if I can tighten the gap. If I could tighten the gap, how do I fix this piece of floor to prevent the gap show again? 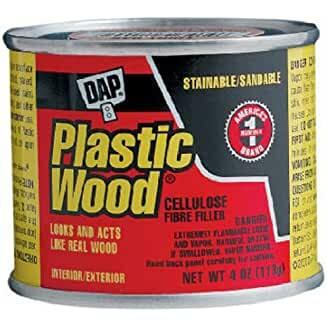 I will see what I can do before using plastic wood. Thanks. If you can get the piece to move, you can tack a nail in the end, the baseboard will likely hide it.